The situation got out of hand quickly when groups of demonstrators started to use violence against the outnumbered policemen, migrants, and meanwhile assembled 1,500 counter protesters on the opposing side. Some smaller felonies were reported. In addition journalists trying to document the events were physically harassed and insulted multiple times. The situation was truly unique in its magnitude, never before had the city experienced something alike in the last decades. After another difficult day the demonstration on the following Saturday, September 1st, brought together several high-standing politicians of Germany’s right-wing party Alternative for Germany (AfD), their supporters, the self-acclaimed movement of “Patriotic Europeans against the Islamisation of the Occident” PEGIDA from Dresden and some far-right extremists in public, which was a first-timer, since the party usually distances itself from PEGIDA, a reservation that did not seem to hold much gravity anymore. 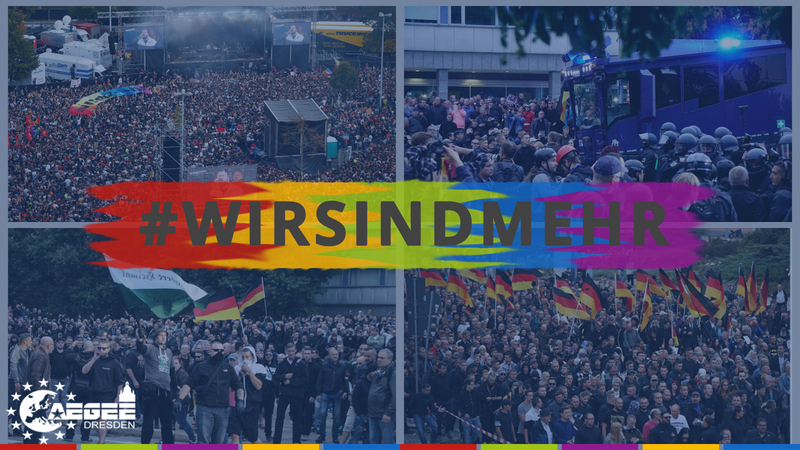 As a response several politicians from other German parties showed solidarity with the anti-Nazi demonstrations, taking place at the same time, and rose their word against hatred and extremism. After the chaotic days local organisers in Chemnitz took an exceptional step in order to oppose the xenophobic demonstrations: in just a few days they organised a music concert under the slogan “Wir sind mehr” (“We are more”), many famous German musicians played their songs in order to activate the German population to speak up against the incidents in the city. More than 65,000 people showed up to the event, showing that they are, truly, more than that and that hate and racism will not be granted free rule in Chemnitz. After these exceptional events in Saxony we, as AEGEE-Dresden, the only AEGEE-antenna in Saxony, feel the need to take a stand against the far-right movements which have unsettled Germany and especially the East of the country. We strongly believe that hateful, xenophobic, discriminating and violent acts are violating our core democratic and constitutionally protected values and thus attack human dignity itself. They are no answer, or “Alternative”! Protesters flashing Nazi salutes are not the the voice representing Germany, nor Saxony. We, however, proudly take a stand for an open-minded society, which welcomes people, regardless their origin. The values and principles shared by AEGEE are the key for a peaceful, diverse and borderless Europe. Those are goals we also hope to implement in our surrounding and impact spaces. We are positioning ourselves strongly against the hatred we have seen in the last days and forcefully condemn the numerous incidents of violation and xenophobia. We stand up for a peaceful civic dialogue and mutual empathy. We are dedicated, instead of spreading hostility, to work for a more inclusive and open society, where all people from different origins can live peacefully, with equal opportunities and rights, in friendship and freedom, protected by humans rights. We invite each and everyone to speak up against the close-mindedness we have had to experience of late! We are happy to represent a different and brighter side of Saxony, an open-minded and peaceful voice of democratic citizenship among many other organisations in this region!